Picture by John S. Quarterman for Okra Paradise Farms, Lowndes County, Georgia, 10 April 2013. 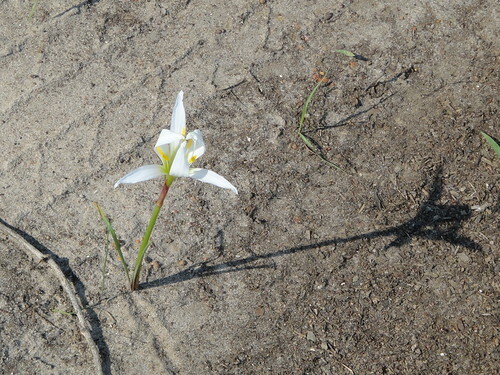 This entry was posted in Treat's Rain Lily and tagged 10 April 2013, Georgia, lily, Lowndes County, Okra Paradise Farms, Treat's Rain Lily, Zephyranthes atamasca var. treateiae on April 16, 2013 by John S. Quarterman. 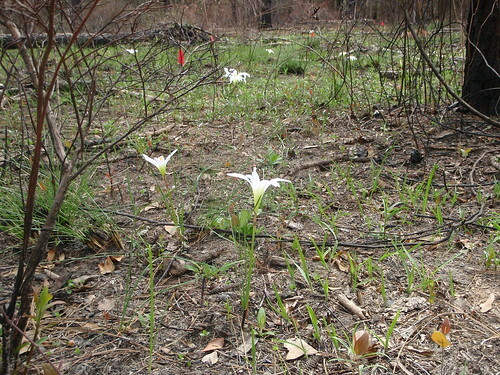 A small lily that grows only in counties along the Georgia-Florida border, and maybe in a few in Alabama: Treat’s Rain Lily, Zephyranthes atamasca var. treateiae. These days it’s classified as an amaryllis. This entry was posted in Okra Paradise Farms, Plants, Treat's Rain Lily and tagged 6 March 2012, amaryllis, Georgia, lily, Lowndes County, Okra Paradise Farms, Treat's Rain Lily, Zephyranthes atamasca var. treateiae on March 9, 2012 by John S. Quarterman. This entry was posted in Treat's Rain Lily and tagged 3 July 2011, amaryllis, Georgia, John S. Quarterman, lily, Lowndes County, Treat's Rain Lily, Zephyranthes atamasca var. treateiae on July 11, 2011 by John S. Quarterman. 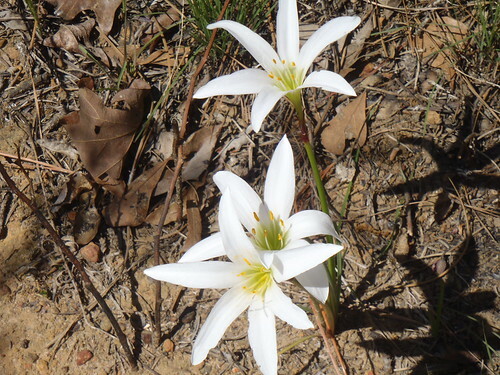 This entry was posted in Plants, Treat's Rain Lily and tagged lily, South Georgia, Treat's Rain Lily, Zephyranthes atamasca var. treateiae on March 17, 2011 by John S. Quarterman. 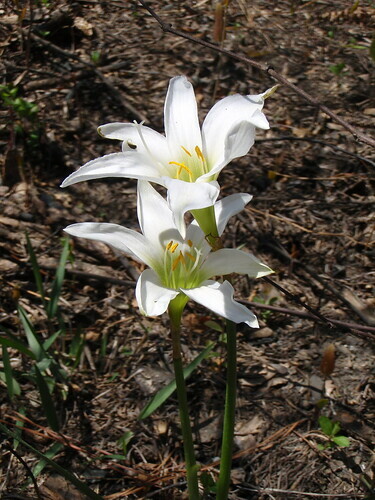 You may know these as Easter lilies, or “those lilies that grow in the ditches by the road in the spring.” It turns out their real name is Treat’s Rain Lily, and they are a native of south Georgia and north Florida, plus a bit of Alabama, and don’t grow anywhere else. 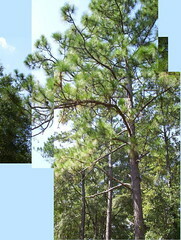 We’ve seen them in Georgia counties along the Florida border as far west as Cairo, but not any farther north. Here’s much more about these lilies. This entry was posted in Plants, Treat's Rain Lily and tagged 2-3 April 2010, Georgia, Lowndes County, Pictures by Gretchen Quarterman, Treat's Rain Lily, Zephyranthes atamasca var. treateiae on April 4, 2010 by John S. Quarterman. 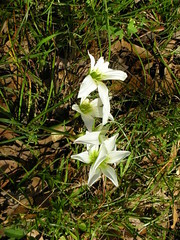 The pictures of Easter Lilies from a few days ago obviously aren’t the big Japanese lilies commonly sold as Easter Lilies; they’re a native plant, found in their native habitat in Lowndes County, Georgia. 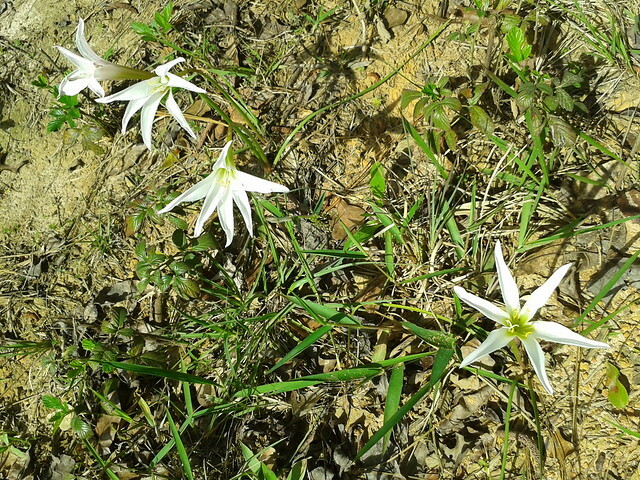 Everybody around here recognizes them, and seems to call them either Easter Lilies, or “those lilies you see in the ditch by the road.” Nobody seems to know any other name for them, neither common nor botanic. 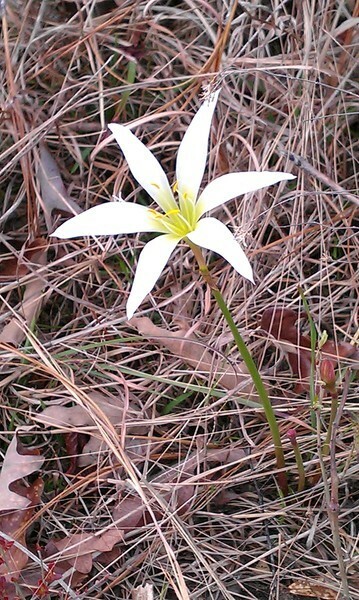 This entry was posted in Plants, Treat's Rain Lily and tagged Treat's rain lily Easter lily Zephyranthes atamasca var. treateiae Amaryllis treatiae (S.Watson)Chapm. Atamosco treatiae (S.Watson)Greene amaryllis lily Gopher Tortoise Council Zephyranthes treatiae S on March 25, 2008 by John S. Quarterman.